If you think that every time you walk around the mall there is a new frozen yoghurt store opening, you are not mistake; according to Chron Small Business the frozen yoghurt industry grew 16% between 2003 and 2009. With the growing popularity surrounding Frozen Yoghurt and the customer demand, more and more people are taking the opportunity to open up their own frozen yoghurt stores. Frozen Yoghurt stores have been popping up all over the place and the trend does not seem to be declining. Not only are these stores providing frozen yoghurt but they are giving customers a social place to enjoy their favourite frozen treat with friends. They are selling an atmosphere on the side of their favourite flavours and toppings. Although these stores have a continuous flow of people coming in through their doors, it is always difficult to get started. The most important qualities any good entrepreneur needs to have are energy and determination. Entering into a market that is already saturated with competition it is hard to find that point of difference that will set you apart from the rest. In order to have a successful frozen yoghurt shop you have to put in the work before opening the doors. Develop a plan and be aware of the impact your store may have and also aware on the struggles that may arise. Before opening the store make sure you know there is a demand for it. Even with the significant growth and popularity surrounding frozen yoghurt, you need to be aware of the customers you are targeting. 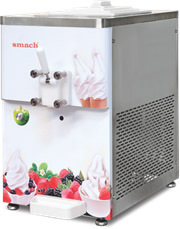 Even though the demand is there for frozen yoghurt, customers may have their favourite store with favourite flavours. Know what market you are about to enter and compare what you have in mind for your own store to the others around you and what makes them popular. Don’t limit yourself to researching your frozen yoghurt competitors, also have a look at other dessert shops such as ice cream parlours, gelato stands and even beverage places. At Frosty Boy our team conduct ongoing research into the market to alert you on the trends and behavioural patterns of the frozen yoghurt market. This knowledge allows you to keep you up to date with the ever evolving frozen yoghurt and dessert market. Before thinking about making your frozen yoghurt store attractive and inviting to customers, make sure you have considered every aspect of opening a new franchise and you have everything you need. Think about the layout and location of a new frozen yoghurt store – is it too close to a competitor? What is the foot traffic like around it? Once you have found the perfect store think about what type of frozen yoghurt store you are going to open, is it going to be over the counter or self service? What equipment do you need? How many flavours are you going to be providing at once? Our experts are committed to helping you get the best out of the opportunities at hand. We carefully help you select the right equipment for your goals and consider all the factors of store location, layout, the best way to serve the product and the potential popularity you hope to achieve. Along with the team committed to providing you with the best options in machines, layouts and research, we have an expert R&D team that has developed a range of frozen yoghurt bases aimed at increasing the choices offered in your store. Along with our number of bases on offer, we also have the ability to create your own formulation specific to your store to help stand out from the rest of the market.